When should you sell your business? There is no universal to this answer because the question is multifaceted and unique to each company. But we can answer another related question. Given a declining growth rate, when is my company’s value maximized? Startups strategic value lies within their ability to grow. The faster a company can grow, the more valuable it is. This relationship is remarkably linear. The chart above shows the public SaaS median EV/TTM multiple. EV is enterprise value, or market cap minus cash. TTM is trailing twelve months revenue - the sum of the last twelve months of revenue. A business that grew 100% last year is worth 14.4x its trailing twelve months revenue, net of cash. And a company that grew 25% last year is worth 4.2x. 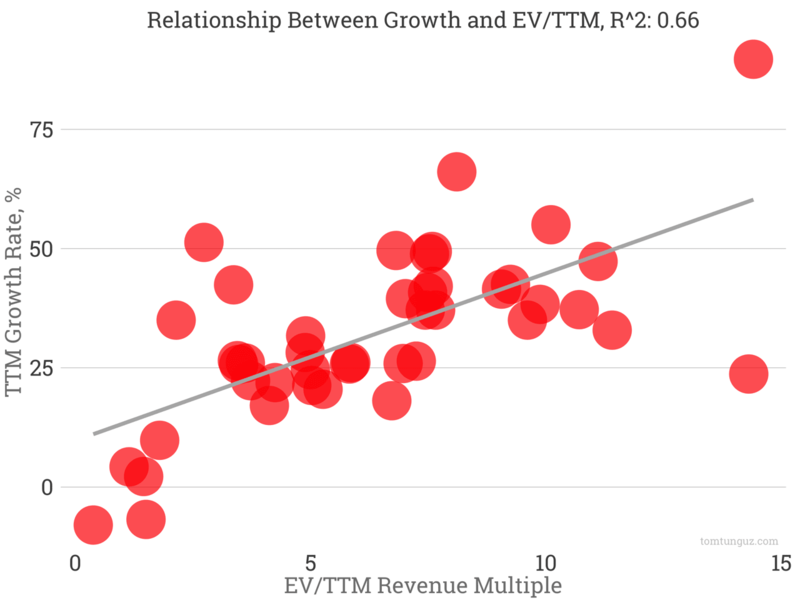 The R^2 between revenue growth and multiple is 0.66. This means the growth rate explains 66% of the variance of the multiple, quite a strong relationship. Assume a startup generates $50M per year. Let’s see how the value evolves in three different scenarios. Scenario #1. The company grows 100% in year 1 and 75% in year 2. Enterprise value increases from $736M to $1B. Scenario #2. The company grows a 75% in year 1 and 50% in year 2. EV rises from $582M to $642M. Scenario #3. The company grows 50% in year 1 and 25% in year two. EV declines from $428M to $342M, despite a revenue increase of $12.5M. This is the counterintuitive part. Just because the business grows doesn’t means it increases its value. It has to grow at a certain rate to be worth more. 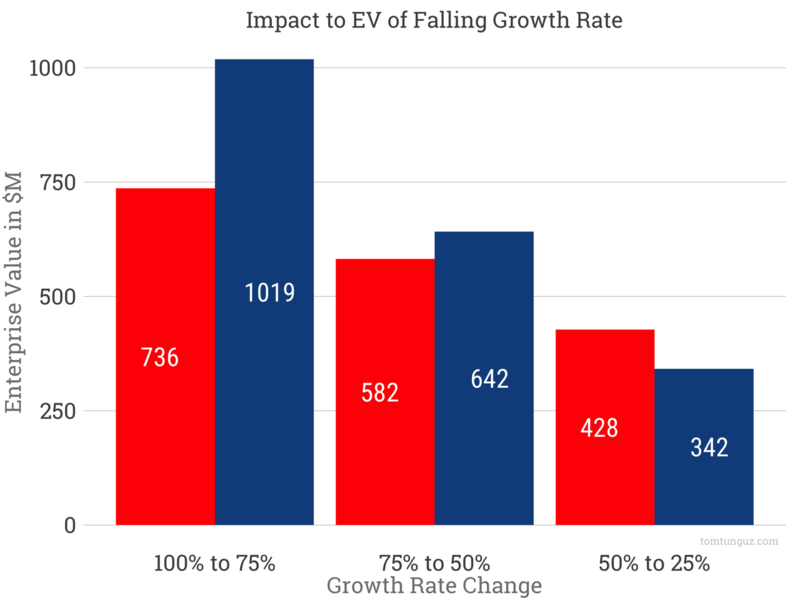 In the last scenario, the company’s EV falls by 20% despite a 25% revenue increase. I can poke many holes in this analysis. Mainly, I’m valuing a business only by one metric, which doesn’t reflect the reality. But the point still holds. Startups are valued for their growth. At some point, if the business can’t grow fast enough, its enterprise value will fall year over year. Selling a business before that occurs will maximize its value.